When you decide to hire an executive search firm to fill a key position, you have likely tapped your network, and have little time to assess multiple candidates in addition to your other responsibilities. The QTI Group is your trusted advisor, taking time to understand your needs and using advanced search methods to find the right leader with the right skills and experiences to guide your organization, align with your culture, and engage your employees. 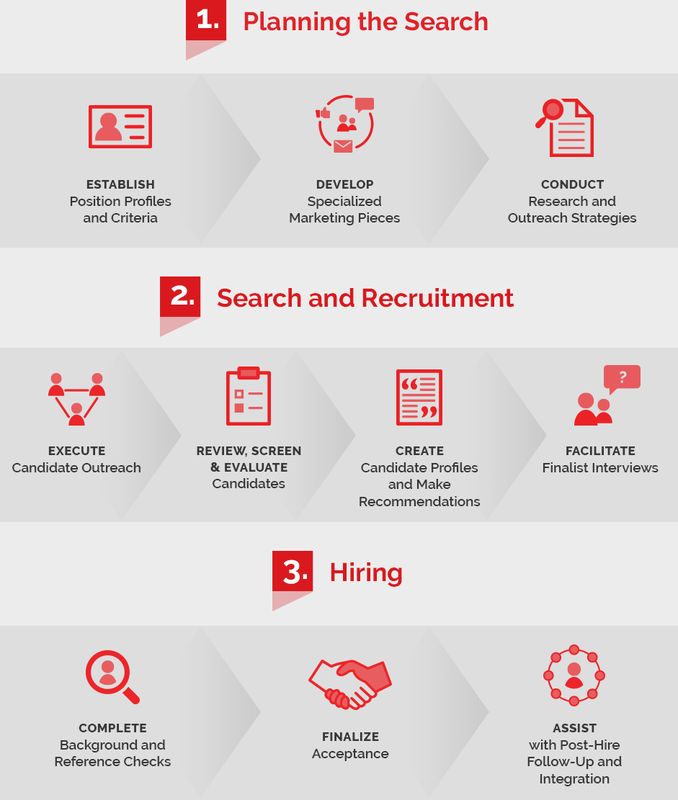 The QTI Group conducts executive searches using a three-part process: Planning and Information Gathering; National, Research-based Search & Recruitment, including in-depth interviewing and clear presentation of top candidates; and Hiring. QTI facilitates a seamless, time sensitive process, resulting in a successful hire. Selecting the right board members is a critical component for the strategic guidance of your company. You want a diversified perspective at the corporate governance level to provide fiduciary responsibility, collaborate with key stakeholders and reflect integrity and passion for your business. The QTI Group provides the third-party expertise to recruit and thoroughly assess board candidates, matching the desired skill set and cultural fit for your organization’s goals. We invest the time to learn your business, conduct thorough interviews with potential candidates, and provide you with a slate of experts from which to make your selection. We understand the characteristics and governing structure for public, private, family and advisory boards spanning various industries. Our extensive professional networks and sophisticated search capabilities allow our consultants to develop candidates from unconventional sources and approach executives that are seemingly inaccessible. QTI’s experienced consultants guide organizations through the complexities of board compensation and governance. Learn more. Conducting an executive or board search is not a one-size-fits-all approach. We offer customized solutions to ensure you are able to hire the exact talent you need. Our teams have placed executives and board members in all industries, ranging from nonprofits and healthcare to finance and insurance. Contact us to discuss how we can help you find your next great leader.